Thematically, Julie Moon's work is rooted in representational imagery and focuses on the relationship between form and surface. She tends to consider her process in two parts: 1| forms built as a canvas for surface design and 2| decoration as a way for her to individuate work, adding character and personality. Ultimately, she believes this process enables her to communicate multiple ideas about a single object, while engaging with both sculpture and painting. 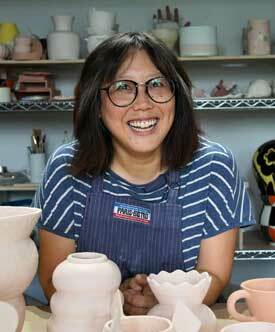 Julie is a Toronto-based ceramic artist. She completed her MFA at the New York State College of Ceramics at Alfred University in 2010, having graduated from the Ontario College of Art and Design (OCAD) with a BFA in 2005. Prior to attending OCAD, Julie spent over a decade working in the garment industry.